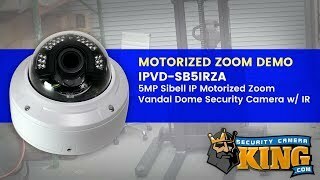 When you purchase this new IP Security Camera, you can be sure that you have some of the latest technology available to deliver superior high definition video footage for your home or business. 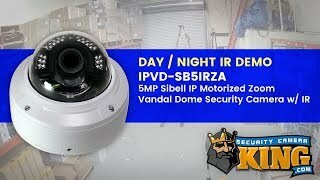 The Sibell series 5MP IP Security Camera is an IK10 rated Vandal Dome with a 2.8-12mm motorized zoom lens. This helps make this camera adaptable in a wide variety of places whether indoors or out thanks in part to the IP66 weather rating. You even have true WDR @120db and that helps you to achieve the best image possible by taking multiple images with different exposures and combining them into a single usable frame that will sharper, more vivid and less washed out. We also love the capabilities like the Analog (CVBS) video output, 1 channel Alarm input and output, and also the Microphone in and out connections. There’s a drop down menu above that you can use to add options to your device. Here you can add an SD card up to 128GB to record footage to directly and you can add a mic kit so you can see and hear remotely. 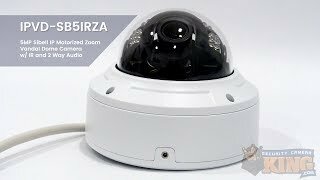 You can easily supply power to this camera using a standard 12V DC power source that most people have readily available or you can plug it into a switch or PoE capable NVR and power it via Power over Ethernet (PoE). For problem areas that have little or no lighting, the built-in LEDs provide enough IR (Infrared) light that allows you to see up to 98 feet away. Another nice feature is the addition of H.265 compression that reduces the file size and bandwidth required to stream live video. When compared with the traditional H.264, this newer codec achieves nearly double the compression of the older standard. For advanced capabilities, this camera even supports smart analysis, including object removal detection, line crossing detection, intrusion detection, etc. All of our Sibell products come with a 2 year warranty, FREE US based tech support for the life of the product and FREE remote monitoring apps. Please note that the POE Mic Kit will only work if you are powering the camera with PoE (Power over Ethernet).